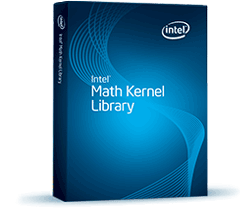 Intel® Math Kernel Library (Intel® MKL) includes a wealth of math processing routines to accelerate application performance and reduce development time. Intel® MKL includes highly vectorized and threaded Linear Algebra, Fast Fourier Transforms (FFT), Vector Math and Statistics functions. The easiest way to take advantage of all of that processing power is to use a carefully optimized computing math library. Even the best compiler can’t compete with the level of performance possible from a hand-optimized library. If your application already relies on the BLAS or LAPACK functionality, simply re-link with Intel® MKL to get better performance on Intel and compatible architectures. Because Intel has done the engineering on these ready-to-use, royalty-free functions, there will be more time to add features which customers request. Using Intel MKL can save development, debug and maintenance time in the long run because today’s code will run optimally on future generations of Intel processors with minimal effort. Intel® MKL includes highly vectorized and threaded Linear Algebra, Fast Fourier Transforms (FFT), Vector Math and Statistics functions. 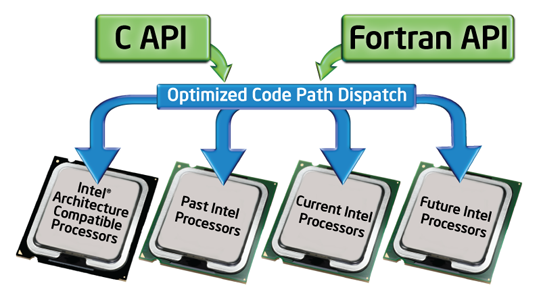 Through a single C or Fortran API call, these functions automatically scale across previous, current and future processor architectures by selecting the best code path for each. Cluster-based versions of LAPACK, FFT and sparse solver – are also included to support MPI-based distributed memory computing. Wherever available, Intel® MKL uses de facto industry standard APIs so that minimal code changes are required to switch from another library. This makes it quick and easy to improve your application performance through simple function substitutions or relinking. 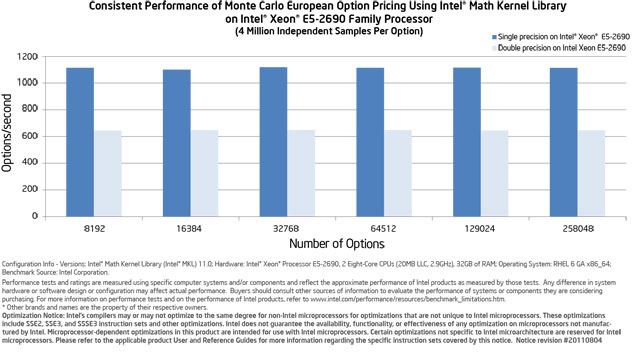 Simply substituting Intel® MKL’s LAPACK (Linear Algebra PACKage), for example, can yield 500% or higher performance improvement. In addition to the industry-standard BLAS and LAPACK linear algebra APIs, Intel® MKL also supports MIT’s FFTW C interface for Fast Fourier Transforms. Behind a single C or Fortran API, Intel® MKL includes multiple code paths — each optimized for specific generations of Intel and compatible processors. With no code-branching required by application developers, Intel® MKL utilizes the best code path for maximum performance. New optimized code paths are added under these same APIs before future processors are released so developers just link to the newest version of Intel® MKL and their applications are ready to take full advantage of the latest processor architectures. In the case of the Intel® Many Integrated Core Architecture (Intel® MIC Architecture), Intel® MKL can automatically determine the best load balancing between the host CPU and the Intel® Xeon® Phi™ coprocessor in addition to full native optimization support. Intel® MKL is also compatible with your choice of compilers, languages, operating systems, linking and threading models. One library solution across multiple environments means only one library to learn and manage. Intel® MKL BLAS provides optimized vector-vector (Level 1), matrix-vector (Level 2) and matrix-matrix (Level 3) operations for single and double precision real and complex types. Level 1 BLAS routines operate on individual vectors, e.g., compute scalar product, norm, or the sum of vectors. Level 2 BLAS routines provide matrix-vector products, rank 1 and 2 updates of a matrix, and triangular system solvers. Level 3 BLAS level 3 routines include matrix-matrix products, rank k matrix updates, and triangular solvers with multiple right-hand sides. Intel® MKL LAPACK provides extremely well-tuned LU, Cholesky, and QR factorization and driver routines that can be used to solve linear systems of equations. Eigenvalue and least-squares solvers are also included, as are the latest LAPACK 3.4.1 interfaces and enhancements. Intel® MKL also includes Sparse BLAS and sparse solvers such as PARDISO and iterative sparse solvers. New in this release of Intel MKL is the Parallel Direct Sparse Solver for Clusters to solve systems of sparse matrices with millions of rows and columns. Intel® MKL FFTs include many optimizations and should provide significant performance gains over other libraries for medium and large transform sizes. The library supports a broad variety of FFTs, from single and double precision 1D to multi-dimensional, complex-to-complex, real-to-complex, and real-to-real transforms of arbitrary length. Support for both FFTW* interfaces simplifies the porting of your FFTW-based applications. Intel® MKL provides optimized vector implementations of computationally intensive core mathematical operations and functions for single and double precision real and complex types. The basic vector arithmetic operations include element-by-element summation, subtraction, multiplication, division, and conjugation as well as rounding operations such as floor, ceil, and round to the nearest integer. Additional functions include power, square root, inverse, logarithm, trigonometric, hyperbolic, (inverse) error and cumulative normal distribution, and pack/unpack. Enhanced capabilities include accuracy, denormalized number handling, and error mode controls, allowing users to customize the behavior to meet their individual needs. Intel® MKL includes random number generators and probability distributions that can deliver significant application performance. The functions provide the user the ability to pair Random-Number Generators such as Mersenne Twister and, Niederreiter with a variety of Probability Distributions including Uniform, Gaussian and Exponential. Intel® MKL also provides computationally intensive core/building blocks for statistical analysis both in and out-of-core. This enables users to compute basic statistics, estimation of dependencies, data outlier detection, and missing value replacements. These features can be used to speed-up applications in computational finance, life sciences, engineering/simulations, databases, and other areas. Intel® MKL includes a rich set of splines functions for 1-dimensional interpolation. These are useful in a variety of application domains including data analytics (e.g. histograms), geometric modeling and surface approximation. Splines included are linear, quadratic, cubic, look-up, stepwise constant and user-defined. Direct Sparse Solver for Clusters extends the capabilities of Intel MKL PARDISO, enabling users to solve large distributed sparse systems of equations on clusters up to 2x faster than competing solutions. Intel® MKL BLAS provides optimized vector-vector (Level 1), matrix-vector (Level 2) and matrix-matrix (Level 3) operations for single and double precision real and complex types. Level 1 BLAS routines operate on individual vectors, e.g., compute scalar product, norm, or the sum of vectors. Level 2 BLAS routines provide matrix-vector products, rank 1 and 2 updates of a matrix, and triangular system solvers. Level 3 BLAS level 3 routines include matrix-matrix products, rank k matrix updates, and triangular solvers with multiple right-hand sides. Intel® MKL LAPACK provides extremely well-tuned LU, Cholesky, and QR factorization and driver routines that can be used to solve linear systems of equations. Eigenvalue and least-squares solvers are also included, as are the latest LAPACK 3.4.1 interfaces and enhancements. If your application already relies on the BLAS or LAPACK functionality, simply re-link with Intel® MKL to get better performance on Intel and compatible architectures.